Clark spoke to supporters Wednesday in Concord, New Hampshire. 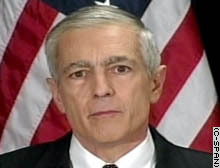 (CNN) -- Democratic presidential contender Wesley Clark said Wednesday that President Bush has shown a lack of will in pursuing al Qaeda leader Osama bin Laden. In a blistering critique of the commander in chief, Clark said that "capturing Saddam Hussein doesn't change the fact that Osama bin Laden is still on the loose." "If I'd been president, I would have had Osama bin Laden by this time," Clark said at a news conference in Concord, New Hampshire, where he was campaigning for votes in the nation's first primary, January 27. "I would have followed through on the original sentiment that the president gave us -- Osama bin Laden, dead or alive. "Instead, he executed a bait-and-switch. He took the priority off Osama bin Laden. He shifted the spotlight onto Saddam Hussein." The retired Army four-star general also said that if Bush questions the patriotism and national security credentials of Democrats in the coming campaign, he would not hesitate to match his record against the president's. "I'll put my 34 years of defending the United States of America, and the results that I and my teammates in the United States armed forces achieved, against his three years of failed policies any day," said Clark, who was NATO supreme commander during the 1999 air campaign in Kosovo. He added, "We've got a president who will go halfway around the world for a photo opportunity but won't go halfway across town for a funeral for an American serviceman. "I've been to those funerals. I've comforted families. ... I don't think you can make good policy at the top if you don't understand the impact at the bottom of your organization." Bush has on only two or three occasions met with the families of fallen servicemen and women, most recently at Fort Carson, Colorado, and he has not attended funerals or greeted caskets returning from Iraq. A senior administration official told The Washington Post in November, "The president believes funerals are a time for grieving families to be together and mourn their loved ones and celebrate their lives, and he has not felt comfortable intruding on that." Clark, who returned this week after testifying at the war crimes trial of former Yugoslav President Slobodan Milosevic in The Hague, Netherlands, weighed in on the case of deposed Iraqi dictator Saddam Hussein. Clark said Saddam should be tried in Iraq, by Iraqis, under standards drawn up by international experts -- with the death penalty as a potential punishment. "I think that you cannot take the death penalty off the table. ... It has to be there, to be applied to war criminals who've used chemical weapons, to those responsible for genocide," Clark said. While congratulating U.S. forces for capturing Saddam from "that snake hole in the ground," Clark said he "can't understand why the president hasn't devoted the same energy and resources to going after al Qaeda that he did to going after Iraq." "Right now, having captured Saddam, the right course for the country is to redirect our energies and capture Osama bin Laden, now. We've got momentum, now," he said. "It's a question of presidential will. If the president will show the will, I'm confident our armed forces will find a way to take him." As president, Clark said he also would "insist that Saudi Arabia take responsibility" and provide resources and intelligence to help the United States get bin Laden, including creating a joint U.S.-Saudi commando unit to root out terrorists. He said the United States should put "intense political pressure" on Pakistan to find bin Laden and move "substantial" U.S. special operations forces and intelligence personnel from Iraq into Afghanistan. To free up those assets, Clark said the United States should end its "fruitless" hunt for weapons of mass destruction in Iraq and turn the task over to the international community. "I could never understand why we insisted on doing this anyway, when the international community was fully willing to participate and do it," he said. "The experienced U.N. inspectors, who've done it before ... were champing at the bit, waiting to go there. We kept them out." Clark said the hunt could be turned over to international inspectors because "weapons of mass destruction are no longer a threat to the United States, at least not from Iraq. We're there. "We need to move on -- let the international inspectors clean out the remnants of this, sort out the programs, talk to the scientists."